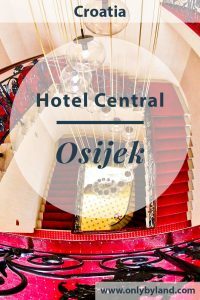 You should consider Hotel Central if you want to stay in a historic hotel located on the main plaza of Osijek. Visit the Hotel Central website for the best room rates. For the latest events and pictures or to chat with them on messenger, check the Facebook page. Additionally you can easily walk to the Museum of Slavonia and Osijek Fortress. 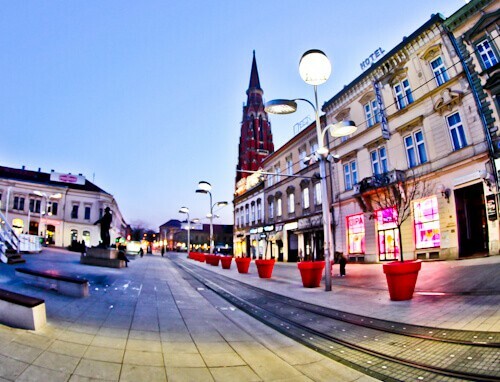 If you’re arriving in Osijek by car, you can make use of the complimentary guest parking and explore the city on foot. 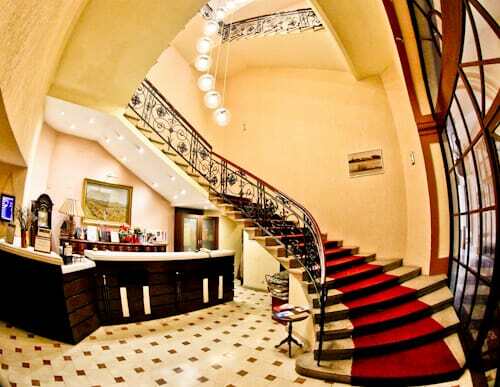 As soon as you enter the hotel, you will receive the historic vibe. The reception is located under the circular staircase. I recommend you look up at reception to appreciate the chandelier. Staff will be pleased to welcome you to Osijek. Any questions you have about the city they’ll answer, you should also pick up a city map. Any complimentary theater tickets you ordered should be available when you check in. As a result you can plan your day around the theater performance. As well as the historic reception area and staircase, the rooms continue the historic feel. In contrast to the historic room, the complimentary WiFi is super fast. 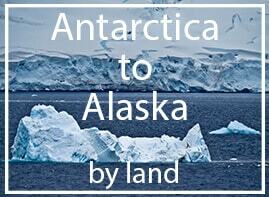 In addition you can watch cable TV channels in English. The view from the room is the beautiful Osijek Co-cathedral, a room with this view must be requested in advance. 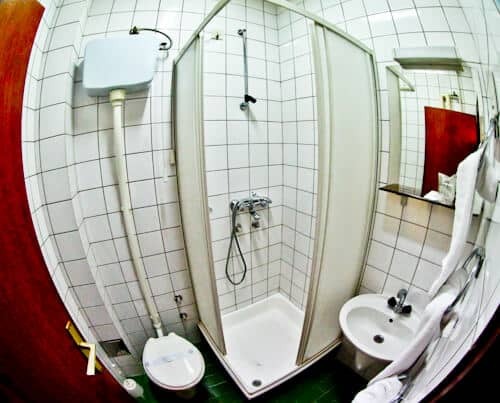 The en suite bathroom has all necessary amenities. The sparkling clean bathroom fits with the historic vibe of the hotel. Croatian tap water is safe to drink and drinking glasses are provided for when you require a drink. 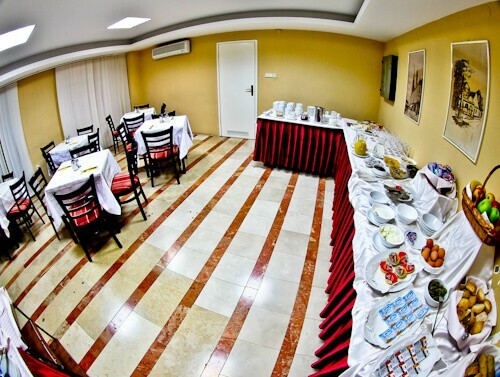 The hotel provides a substantial breakfast buffet, consequently you’ll be able to gain the energy required for your days activities in Osijek. Included in the breakfast are hot meats, cold meats, eggs, fresh breads, sweet pastries, fresh fruit and yogurts. To drink you can choose fruit juices, water, coffee or a selection of teas. 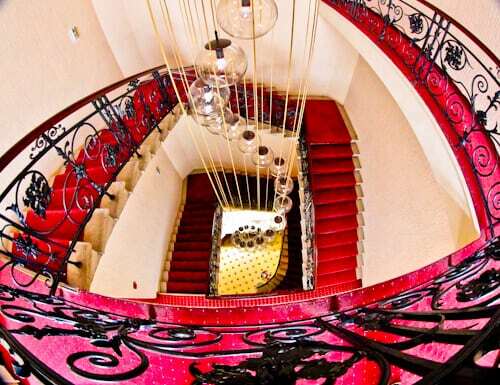 Hotel Central has one of the most beautiful staircases you’ll see in any hotel. The main advantage of staying in a historic hotel are to see unique interiors such as this. In addition to the Instagrammable staircase, you’ll find a small library. You are welcome to read any book whilst relaxing in the historic surroundings. 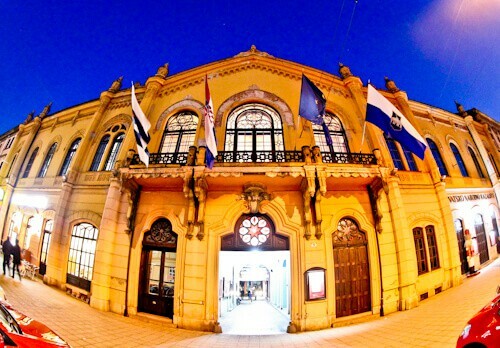 The Croatian National Theater of Osijek is located a block away from Hotel Central. When you book a room with the hotel you will receive complimentary tickets to watch a performance. In addition you can choose the performance you want to see. I recommend communicating with the hotel through their Facebook chat to organize this. 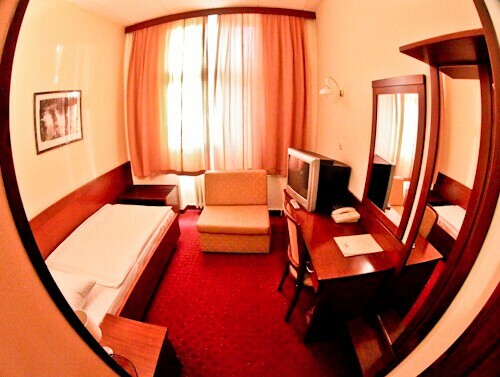 Hotel Central will give you a true Osijek experience. Those who love to stay in historic hotels will be treated here. In addition to taking advantage of the complimentary theater tickets, you should ask about museum tickets. 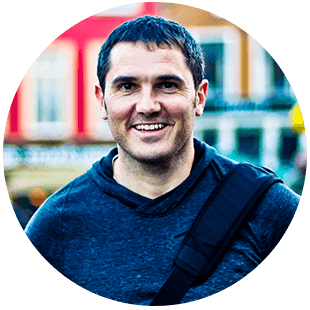 The staff will be keen for you to learn about the history of Osijek and Slavonia. Enjoy your stay and more importantly, enjoy the Osijek welcome from the staff. Visit the Hotel Central website for the best room rates. For the latest events and pictures or to chat with them on messenger, check the Facebook page.